WHITE HOUSE – President Donald Trump and several members of Congress, including three Texans, spent Tuesday preparing for a Wednesday rollout of what many Republicans hope will be a dramatic restructuring of the U.S. tax code. The stakes are high as Senate leaders announced Tuesday that they would postpone further work on repealing former President Obama's 2010 health care law until after the Congress addresses a tax overhaul. There is now a must-succeed sensibility toward rewriting the tax code among Texas and national Republicans. Trump and Vice President Mike Pence met with the members of the U.S. House Ways and Means Committee in the West Wing's Roosevelt Room. 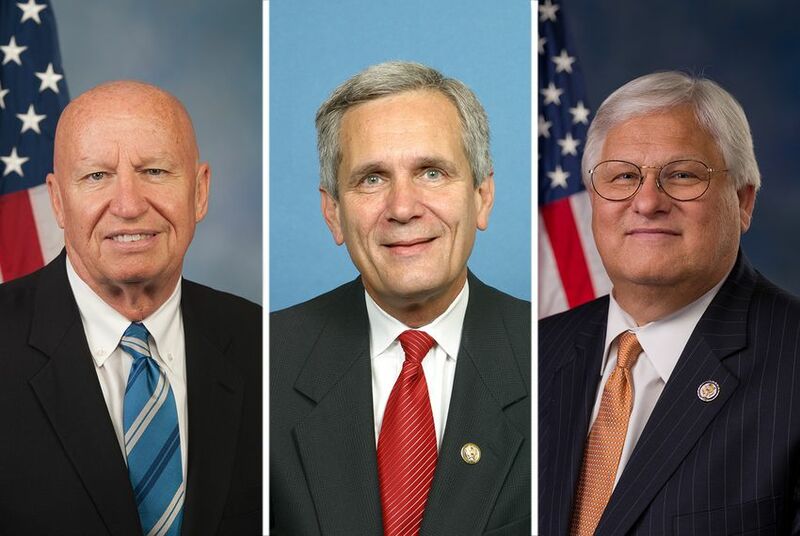 Attendees included U.S. Reps. Kenny Marchant, R-Coppell, Lloyd Doggett, D-Austin, and the committee chairman, U.S. Rep. Kevin Brady, R-The Woodlands, who sat to Trump's left. Brady, who has been pushing a tax overhaul since January, has been at the center of negotiations among Republican leaders. This is a favorite issue of U.S. House Speaker Paul Ryan. Prior to his ascent as the Republican leader, he served as the chairman of the Ways and Means Committee. Brady, a close Ryan ally, succeeded Ryan in the post in the fall of 2015. Ryan will likely be the face of this legislative push, but Brady, too, is an omnipresent advocate for major changes to the tax code. Even so, the chairman spent the early part of the week shying away from specifics on the policy rollout. "We’ve worked through these provisions so that ultimately, based on the framework this week, we will deliver and unveil the comprehensive tax reform plan after the budget is completed by the House and the Senate,” Brady told reporters on Monday. Politically, there is a sense among Republican operatives both in Washington and in Texas that there is no room for failure on a tax overhaul. Increasingly, GOP donors are voicing anger at members of the state delegation for the lack of legislative headway in the first year of the Trump presidency with Republicans controlling every facet of the federal government. There is no issue that elicits this dissatisfaction more loudly than the failed efforts to repeal former President Obama's 2010 health care law, which suffered another blow Monday night when a pivotal Republican Senator, Susan Collins of Maine, confirmed she remained opposed to the latest version of the legislation. Ways and Means Republicans have held a series of "retreats" in recent days to hash out details of an overhaul plan. Democrats were not included. Notably, Trump included Doggett and other Democrats in his Tuesday meeting at the White House. "Trump asked for Democrats to jump on the caboose after the tax train has already left the station," Doggett said in a statement. "I saw no Democrat ready to jump on board." Meanwhile, GOP senators were still coming to grips with health care falling apart once again. Senate leaders emerged from a lunch meeting on Tuesday to announce they were canceling an expected vote this week on the latest plan to repeal the Affordable Care Act. "We need to continue to working to get to 50 [votes]," U.S. Sen. Ted Cruz told reporters. "For seven years, Republicans have promised the American people that if you elect us, we'll repeal Obamacare. We've got to honor that promise, and as soon as we have 50 votes, we should pass it." "This has been a process. It is frustrating that we haven't gotten there yet," he added. "I'm frustrated. Everybody else is frustrated, but we're making progress. We are closer than many outside observers believe."